Step One: Have annual discussion about whether we should use our artificial tree or purchase a real one. As with the past four years, this discussion always ends with the same result, yet we feel obligated just the same to talk about saving money, protest the slaughter of trees, pine for the Christmas tree smell (hahahha, get it? Pine? Oh, how I crack myself up! ), and whine about the eventual carpet of needles on the floor. Step Two: First weekend after Thanksgiving plan family outing to choose the perfect tree. Step Three: Reschedule due to nasty, cold, wet, weather all weekend. Feel defeated and depressed that total tree enjoyment time is slipping away. Step Four: Second weekend in December make pact with family that NOTHING will prevent said family from bringing the perfect tree home that weekend. Step Five: After browsing tree selection at Not the Normal Tree Place realize it's just not the same experience. Drive to Normal Tree Place and sigh with relief. Within fifteen minutes drive home with the point of a Frasier Fir poking you in the shoulder. Step Six: Watch husband lug tree inside while offering helpful advice. Wait for husband to tinker with lights and hang lights on tree. This process might take a few days. Watch eager 6YO, whose philosophy is, "Lights? Who needs lights?" begin to hang ornaments anyway. Watch husband take ornaments off. Repeat as necessary until husband finishes hanging lights. Stifle giggles. but I'm downright giddy over them. p.s. See that large circle ornament that looks like it came from a tree trunk? Well, it did. The tree lot guy cut it off our tree and told Annelise to make an ornament, which she joyfully did bright and early the next morning. I love it. p.s.p.s. As of now, we only have one tree this year. I know. It hurts. Our other little trees have bit the dust, or at least the lights on them have, and we haven't replaced them. I miss them. Especially my flamingo tree. p.s.p.s.p.s. We don't have a tree skirt. Do you? Growing up we always just put a sheet around the base of our trees (and sometimes it wasn't a white sheet, there were flowers) so that's what we do now. Except I make sure it's a white sheet to simulate snow. And of course I haven't done it yet. I felt justified by my anti-tree skirt policy once I read The Nester's stance on the issue. What do you say? And finally, p.p.p.p.s (I have lost all track of the right way to do multiple p.s., or make it plural) The only present under our tree is a gift Annelise made at school and brought home yesterday. I'm obviously in denial. How many days until Christmas? Wait, don't tell me. Love the pictures! What a cute idea. What a beauty of a tree. LOVE the photo idea. So, so cute. 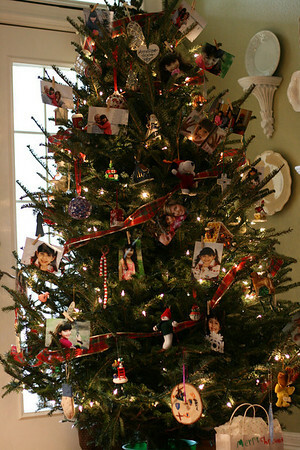 I think clipping photos from the year to the tree is a great idea! My favorite ornaments are the little wood cubes with photos on them, and we have the tradition of making new ones each year. We have a tree skirt that my mom made for us a long time ago. tree skirt here, and honestly, i don't remember what we did growing up. our tree skirt is good old-fashioned white with red trim. Thanks y'all! I forgot to mention the 8th step--the fiddle step--where I tweak and fiddle and rearrange ornaments almost daily. It's a sickness. The picture in this post is already outdated. ha! love it! We never banter about real vs. articifical but do banter about where the heck the tree is stored. I know where it gets put intially after Christmas, but my husband has a hobby of reorganizing the garage and basement seemingly every week. PSS- And, truth be told, I am so not into decorating the tree. I stick some picks and berries and call it good. PSSSSS - we don't have one single present under our tree. Ho! Ho! Ho! I love the pictures on the tree. Great idea! We have a tree skirt. I resisted the urge to redistribute ornaments since I knew they would just get moved again anyway. love the photos! since daughter hung about 5-10 ornaments and son has not, I may have to use this idea! tree skirt: I started one the year daughter was born. Each year the kids paint a hand print on it (large felt circle. we write their names and the year w/ glitter. Son will only do one more year. I told him when he's grown w/ kids I'll turn it over and put theirs on the back! Silken: That's a GREAT tradition and one that will make a treasured keepsake. Now that our tree is starting to droop, there's another round of ornament (and garland)redistribution going on.